So, I don’t think I’m divulging any secrets here, but, honestly, it turns out that my husband has asthma (just kidding, I knew that). And so, I’ve been watching my kids, because, although it’s not like a guarantee that they’ll face his same challenges…I have asthma, too and so, I almost feel like “what’s the chances my kids WON’T.” So, when my littlest started wheezing a few weeks ago, I already knew What to do When Your Baby is Wheezing–and I was on the ball getting her taken care of. Don’t Panic. The last thing baby needs is a mamma losing her mind. I’m not kidding. There’s worse things in the world that could happen and you have time to help her. Unless she’s turning blue. If that’s happening–just call 911, forget about reading this. Check Baby’s Mouth. You want to make sure there’s not a piece of hot dog or chicken nugget blocking the breathing path. I know it’s been 2 hours since you fed her, but those little babies–they’re like chipmunks. I found mine gnawing on the end of a bell pepper the other day…just check the path. Do a finger-sweep…trust me. Get Someone Else’s Opinion. You can call your spouse (that’s what I did), you can ask the other mom you’re at a playdate with (I also did that), you can just pull some random nice-looking elderly lady off the sidewalk and ask her. But you need to confirm that your baby is wheezing. If you can’t ask someone else in person immediately–just go to the next step and ask the nurse on the phone to listen to baby’s chest and hold the phone up. Please note, I also did this. I’m totally on the ball with this step. Call Doctor. Ok, so if you’re not imagining things, baby is wheezing, baby isn’t turning blue (because you just call 911 if that’s happening), there’s nothing in her mouth and it’s not a boogie, you should totally call the doctor and see if they can see baby immediately-ish. They need to check him for being sick or administer a breathing treatment–or just pat you on the head and tell you baby’s ok. But at this point, baby should see a professional (and not just the old lady on the side of the road). Steamy Bathroom. In a pinch, you can stand in the steamy bathroom with baby and get some warm air going. Sometimes that will open the lungs up enough for them to feel a little relief. It’s not a breathing treatment and it’s not a remedy. But, I’ve done it for myself and my husband has done it, too, and it makes a difference in breathing quality. So, if you’re just in a pinch, a hot, steamy bathroom might just give that baby a moment of relief. 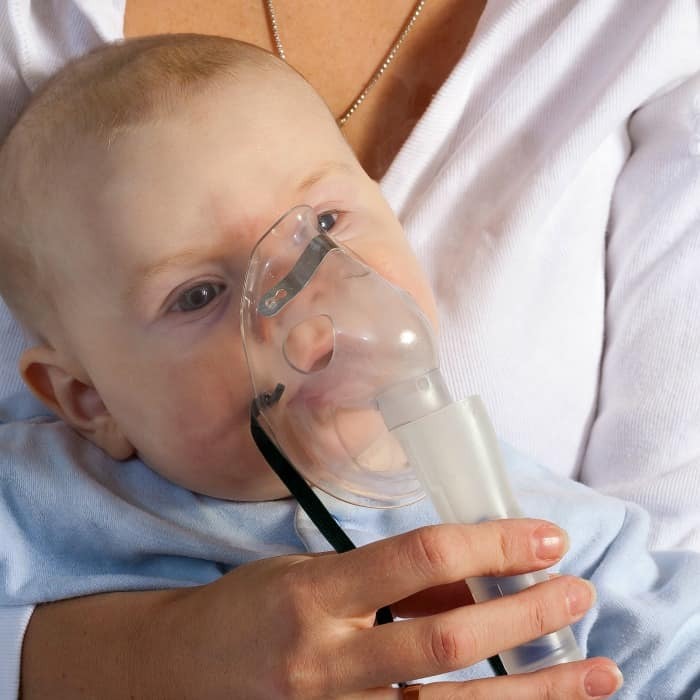 Again–not a real treatment and not something to do if baby is turning blue (because we call 911 for that and head to the emergency room), but an acceptable choice if no other is possible when baby is wheezing. 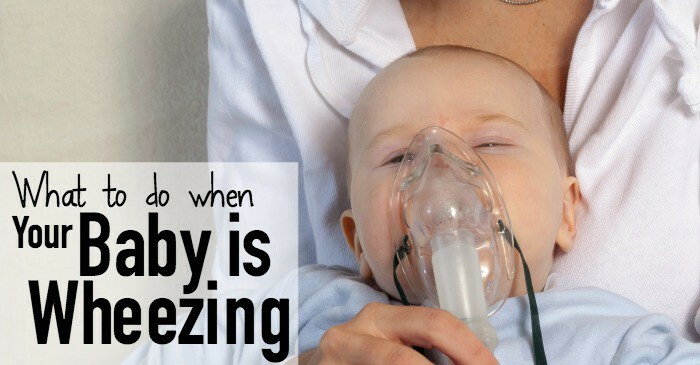 So, this is basically the exact list I follow when my baby is wheezing. 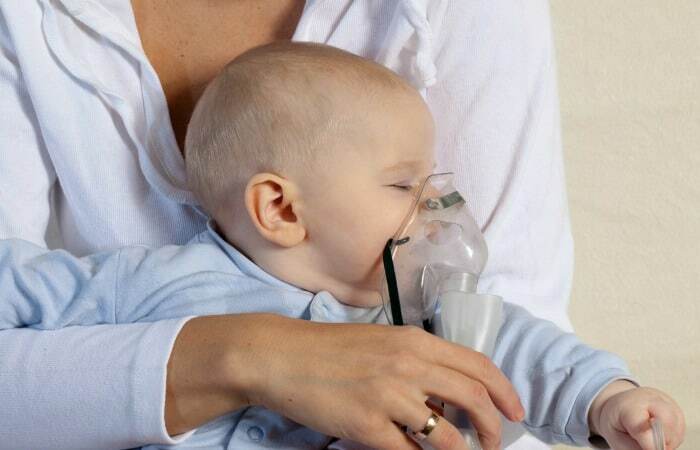 And, just because baby is wheezing doesn’t mean she has asthma–that has to happen a lot more often than the two times mine experienced it, but you still need to go to the doctor. Because it might be a virus–or something else altogether. Anyway. Be smart. Be safe with that baby.